ADAMSON HOSPITAL, BANK STREET, CUPAR The oldest part of the hospital, designed by local architect Henry Allan Newman, opened in 1904. Alexander Adamson, after whom the hospital was named, died in 1866 bequeathing the residue of his estate for the purpose of founding either a school or a hospital in or near Cupar. 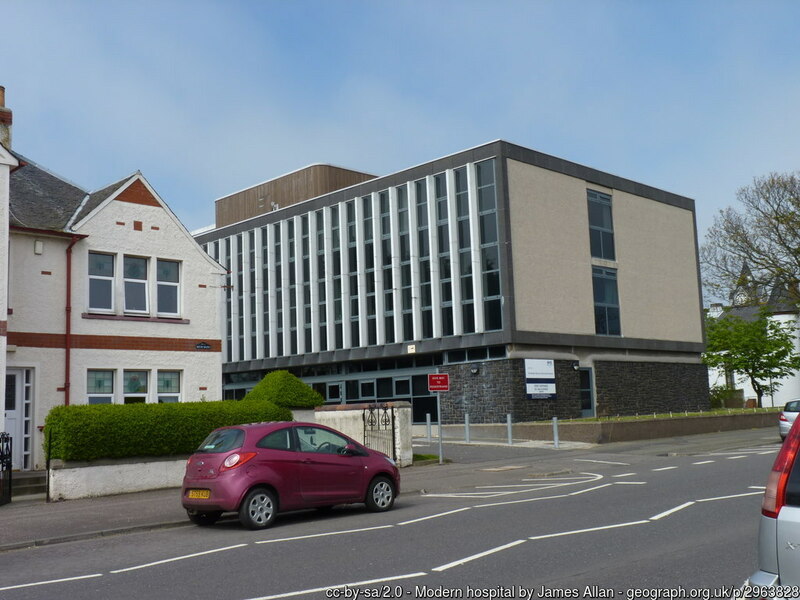 The trustees decided upon building a hospital and the first Adamson Hospital was built in 1873 in Ceres, near Cupar, by another Cupar architect David Milne. It opened in 1874 but Ceres proved to have been an unsuitable location, being too far removed from medical attendance. In 1883 the trustees were forced to close the hospital and it was later leased to the Leith Fortnight Holiday Scheme, providing under-privileged town children with a ‘fresh-air-fortnight’. The building was finally purchased by the Scheme in 1901. 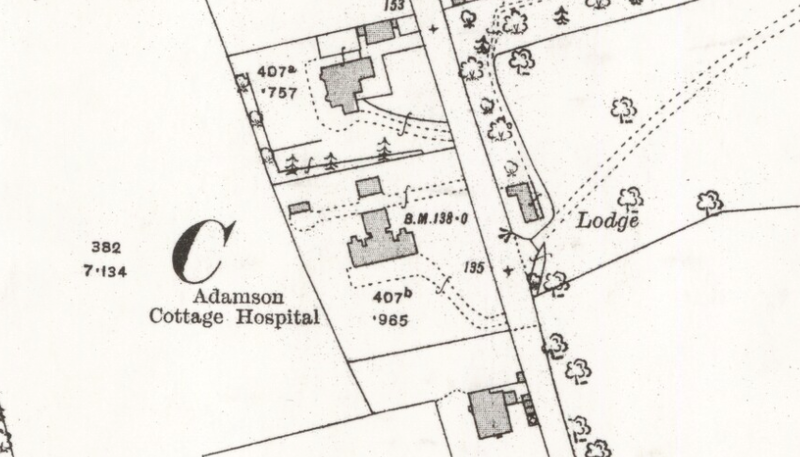 The sale of the building enabled the Adamson trustees fund the new cottage hospital in Cupar. In 1903 they joined forces with the Sick Poor Nursing Association in Cupar and after obtaining plans from three local men: Henry Bruce, David Storrar and H. A. Newman, the last of these was appointed and work progressed quickly. The hospital opened towards the end of the following year. BANDRUM HOSPITAL, SALINE Bandrum house and estate is noted in Groome’s Gazetteer of the 1880s without giving any details. Situated just outside Dunfermline, the house was purchased and adapted to provide a children’s home by the Carnegie Dunfermline Trust in 1927 and formally opened in 1929. The Carnegie Trust bought the house from the trustees of Mr Burnett Smith, husband of the Scots novelist Annie S. Swan, who had acquired it in about 1920 from Henry Ness, local colliery proprietor. Ness had some time before then enlarged and renovated the house. Two wards were added and the house itself adapted for staff quarters, the main hospital kitchen, dayrooms and dining rooms for the children. It provided 32 beds. BURNTISLAND FEVER HOSPITAL, Leven Street Groome’s Gazetteer of Scotland notes Burntisland Fever Hospital as dating to 1880. The building seems to survive, now Nos 9 and 11 East Leven Street, and long-since converted into private domestic use. It is a low, single storey, symmetrical building, stone built with coursed rubble and ashlar facings. The windows – singles either side of the central entrance, bipartite for the outer bays, have chamfered heads and corbels supporting the window sills. 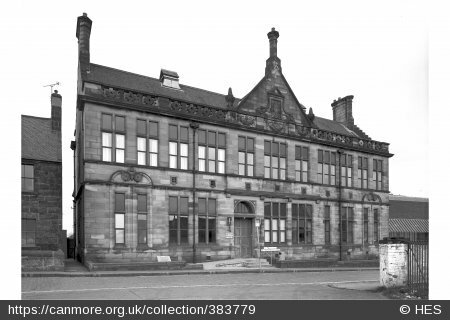 CAMERON HOSPITAL, WINDYGATES In 1912 the joint infectious diseases hospital for the burghs of Buckhaven, Methil and Innerleven was centred on Cameron Bridge House, a Baronial mansion house of modest size designed by David Bryce and built in 1849 for the distiller John Haig. In 1912 a group of ward blocks were built by W. D. Telfer, ranged in a square to the rear of the house. These single‑storey harled and tiled pavilions are good examples of their type. The hospital was transformed in the 1930s into the North East Fife County Infectious Diseases Hospital to replace the smaller units scattered over the East Neuk. The new blocks were designed by Williamson & Hubbard. Alongside the older blocks they provided an impressive two‑storey administration block, four new ward pavilions and a nurses’ home which were completed in 1939. The administration building and nurses’ home in particular are good examples of the functional 1930s style with harled walls and red tile roofs. One of the post-war additions to the site. Photographed in February 2006 by James Allan. CARNEGIE CLINIC, PILMUIR STREET, DUNFERMLINE The clinic was provided by the Carnegie and Dunfermline Trust. Together with the college of hygiene, these were the first institutions of their kind in Scotland. The Carnegie Clinic was built c.1912 to designs by the Glasgow architect David Barclay. ‘Stolid Franco-Scots Renaissance’ according to John Gifford in the Pevsner Guide. CRAIGTOUN HOSPITAL, ST ANDREWS The hospital was established in Craigtoun House, formerly Mount Melville House, which was built to designs by Paul Waterhouse in 1902 for the brewer James Younger. It is a very large Edwardian free‑style house with a dramatic skyline of gables and conical and facetted roofed turrets. The composition is augmented by good retaining walls and wrought‑iron gates. Extract from the 2nd edition OS map, surveyed in 1893. Reproduced by permission of the National Library of Scotland. There was a much earlier house on the site which had been replaced by a neat Georgian house and one of the gate lodges from this house survives. Until recent decades, the Edwardian house retained lavish interiors with seventeenth century‑style wood panelling, marble and alabaster staircase and balustrade, plaster ceilings and stained glass. 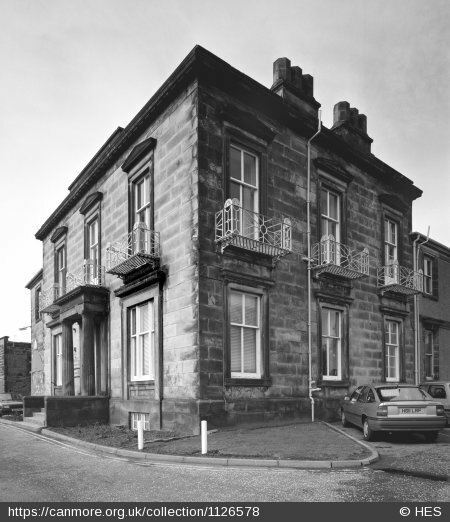 The house was converted to a maternity home by the Fife County Architect, R. S. Lawrie, to provide accommodation for 40 patients and as many nursing and domestic staff. The architect’s intention in the conversion was to depart for the institutional character of a hospital and create the atmosphere of a guest house. On the ground floor were created an isolation theatre, labour room, operating theatre, sterilising departments, patients’ wards, two nurseries and a sun parlour. On the first floor were further wards, nurseries and medical rooms together with 24 bedrooms for sisters and nurses. The matron and assistant matron were provided with suites, comprising sitting room, bedroom and bathroom. The floors of the wards, nurseries and medical rooms were laid in terrazzo and walls were enamel coated. The home was also to be a training school with lecture and study rooms provided. Plans were set in motion in 1978 for the conversion of part of the ground floor to a 31‑bed geriatric unit with a new single‑storey, flat‑roofed block protruding from the side of the house. The addition is not sympathetic to the house, masking an arcade which ran along this elevation. DUNFERMLINE & WEST FIFE HOSPITAL, REID STREET, DUNFERMLINE Formerly the Dunfermline Cottage Hospital, it was first proposed to establish such a hospital in 1891 and progress was aided by a legacy of £1,200 from Mr John Alexander which allowed the Hospital Committee to proceed with acquiring a site in Reid Street from the Parochial Board. They appointed Sydney Mitchell, by then well established as a hospital architect. The original building only contained sixteen beds and was very soon in need of extension. Shortly after it opened four more beds were provided and in 1898 a new wing containing an operating theatre and observation ward was built. A further wing, added in 1904, was also designed by Sydney Mitchell. A major extension was opened in 1931 by Sir Ralph Anstruther designed by the local firm Muirhead and Rutherford. These additions were based around Priory House, a domestic villa of c.1835, acquired by the hospital managers and used for staff accommodation. A casualty block was added in the 1950s designed by John Holt, architect to the South East Regional Hospitals Board. DUNFERMLINE MATERNITY HOSPITAL, IZATT AVENUE Designed by Muirhead & Rutherford, the maternity hospital opened in 1937. A distinctive use of materials give character to the building; black and red brick bands form a deep plinth with harling above. The stone entrance is classically detailed and set in an austere Art Deco frontispiece. White painted eaves and a green slate roof cap the building. DYSART COMBINATION POORHOUSE, THORNTON (demolished) Plans were drawn up for this poorhouse in 1860 by James Walker, and it was opened a year later. It was situated at Thornton, near the railway, in Markinch parish – the combination originally comprising Markinch, Dysart and Wemyss. EAST WEMYSS ISOLATION HOSPITAL This small hospital was opened c.1875 and closed c.1902. FORTH PARK HOSPITAL, KIRKCALDY Kirkcaldy Burgh Council acquired the c.1860s Jacobean style villa, Forth Park House, in the 1930s. In 1937 the house was converted into administration offices and a nurses’ home for the new 30‑bed maternity hospital constructed on the site by Williamson & Hubbard. FOSTERTON HOSPITAL, THORNTON A smallpox hospital, situated to the north-west of the Kirkcaldy Infectious Diseases Hospital on the edge of Thornton, and built about the same time – around 1900. 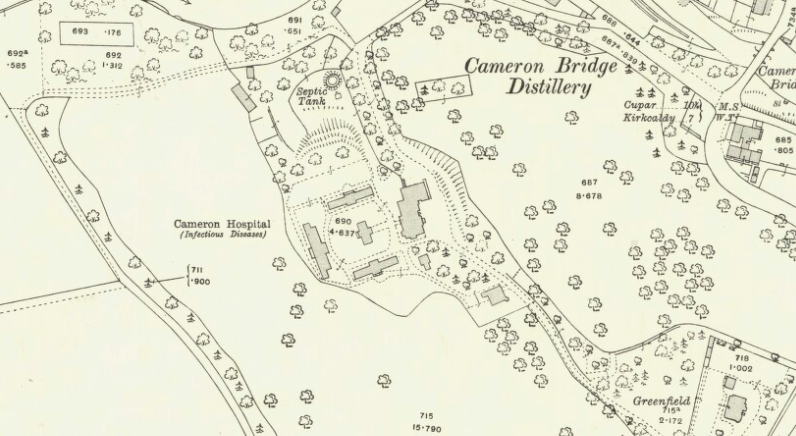 It was still marked as a smallpox hospital in the OS map published in the 1950s, but by 1961 was labelled as Fosterton Infectious Diseases Hospital. It seems to now be, or lately to have been, the Fosterton Firs residential care home, seemingly in the original buildings. GLENROTHES HOSPITAL The hospital opened in 1980 (official opening October 1981). It was designed by the Common Services Agency for geriatric, young chronic sick and GP patients with around 80 beds and a 20-bed day hospital. HUNTER HOSPITAL, HUNTER STREET, KIRKCALDY The house of St Brycedale was built in 1786 for George Heggie. John Hunter lived there until his death in 1916. In accordance with his own request he was buried in the grounds of the house where a baroque canopied monument was raised to mark his grave. He left the house to be furnished and equipped as a hospital for the reception of poor patients, not being paupers, who could not be treated at home and primarily for those suffering from incurable diseases. At the time of his death his trustees did not consider he had left sufficient funds to proceed and the estate was allowed to accumulate. In 1935 work was commenced and the local architects Williamson & Hubbard employed to build an extension. They mistakenly thought that the house had been designed by William Adam, who had been born in Kirkcaldy. This belief led them to take particular care not to alter the house more than could be helped and to keep the additions in harmony with the old building. KIRKCALDY COTTAGE HOSPITAL, Nether Street (demolished) The hospital opened on 15 November 1890 largely due to the patronage of Sir Michael Nairn. It was designed by the St Andrews architects J. Gillespie & Scott and they remained the architects for later additions. In 1895 plans were drawn up for a proposed addition of a circular ward and in 1914 the hospital minutes record Sir Michael Nairn’s intention of giving funds for a larger extension with a large new circular ward and a new operating room. KIRKCALDY DISTRICT INFECTIOUS DISEASES HOSPITAL, Strathore Road, Thornton Built to the west of Thornton, this hospital opened in 1902. Situated on the north side of the road, opposite the railway sidings at Redford, it comprised single-storey ward blocks grouped around an attractive two-storey administrative building, lodge and staff house. The ward blocks were grey harled with red-sandstone dressings with some attractive details. West of the site and set back up the hillside was a smallpox hospital (later Fosterton Hospital). KIRKCALDY & DYSART POORHOUSE, KINGHORN Re‑named the Abden home by 1939, the plans by William Lambie Moffatt were drawn up in 1849 for this poorhouse. It has an impressive site on the cliff tops overlooking the Firth of Forth, though as the map below shows, the position was very isolated. It was of standard design, symmetrical with three gables on the facade. Extract from the 2nd edition OS map revised in 1894, reproduced by permission of the National Library of Scotland. Note the rifle range marked on the other side of the railway line. KNOX COTTAGES, SOUTH ROAD, CUPAR Not a hospital, this was built as an almshouse, but the map is so good, I can’t bear to leave it out. Built as the Knox Institution in 1839 for women over 50 who had seen better days, it comprises a terrace of six two-storey cottages, and was founded by David Knox, a native of Cupar who lived in London and his sister Catherine, who returned to Cupar after her brother’s death to put their plan into effect. Extract from the OS Town Plan of Cupar, 1854, reproduced by permission of the National Library of Scotland. LEVEN BURGH INFECTIOUS DISEASES HOSPITAL (demolished) The Leven Infectious Diseases Hospital was opened c.1899. The fever hospital was the earliest on the site, later the Bain Isolation Hospital was added to the north-east. Extract from the 2nd edition OS map revised in 1913, reproduced by permission of the National Library of Scotland. When built the fever hospital was on the very edge of the burgh, but the site is now entirely surrounded by post-war housing. It is a single storey, white harled building, with a blind oculus in its gable, dated 1899 and with a memorial inscription stating that it was ‘built in memory of Alex & E White, by their children’ The fever hospital later became a chidren’s home, and most recently a children’s nursery (Alex White Building). Bain Hospital was known as Greenbanks in the 1960s, but was demolished, probably when the Robert Gough Centre was built on the site of the former works just to the south. LINNWOOD HALL CONVALESCENT HOME, LEVEN Also known as Carlow Hall Convalescent Home this Tudor Jacobean mansion was built in 1898-9 to designs by Gillespie & Scott. Known locally as Carlow Mansions it was built for Charles Carlow, Chairman of the Fife Coal Company, Deputy Chairman of the North British Rail Company and a Director of the royal Bank. In 1947 his son turned the house into a convalescent home for miners’ wives and female colliery workers. MACLEAN HOSPITAL, BELLYEOMAN ROAD, DUNFERMLINE This small fever hospital was built in a corner of the poorhouse site built in 1849, and was still extant in 2015 – now converted into a private house. It is of two storeys, with short single-storey wings, and stone built with tall sash windows. Extract from the OS Town Plan of Dunfermline, 1854, reproduced by permission of the National Library of Scotland. It was named after the Revd Allan MacLean, £500 being donated by the trustees of his will for the purpose of erecting such a hospital. Additional support was given by the Parochial Board, which presumably gifted the site. MacLean’s trustees, James Hunt of Pittencrieff, Robert Douglas of Abbey Park, and the Revd Peter Chalmers, formed the original managing committee of the hospital. An epidemic in the town had prompted the idea, and the hospital was more particularly intended at the outset for maid-servants or others who did not live in houses of their own, or who lived in houses with ‘defective accommodation’, in other words either insanitary or where isolation was impossible. Patients might be asked to pay a small fee, or be given care gratuitously, according to their circumstances. MARIE CURIE MEMORIAL FOUNDATION HOSPITAL, HILL OF TARVIT, CUPAR The hospital was established at Hill of Tarvit house near Cupar in 1952, and was the first Marie Curie home for cancer patients. The charity opened nine further homes between 1953 and 1965 in the UK, including Strathclyde House, Glasgow, in 1954. Hill of Tarvit was bequeathed to the National Trust for Scotland in 1948, but only the ground floor rooms were opened to the public, the upper floors were used by the Marie Curie Foundation until 1977. With the departure of the Foundation the whole house was opened up by the National Trust. MILESMARK HOSPITAL, DUNFERMLINE Initiated by a Joint Committee of Dunfermline Burgh and County Councils, a competition was held for the design of this infectious diseases hospital in which 17 plans were submitted. The County Medical Officer provided guidelines for competitors but considered that only the plans by Johnstone and Burnie incorporated all the requirements. Extract from the 2nd edition OS map revised in 1894-5, reproduced by permission of the National Library of Scotland. The hospital was built in 1892‑3, well outside the town, and consisted of a central administration block with two observation wards attached to it but at the same time isolated from it with their own entrances from the outside. They also had a sealed glass window looking through into the doctor’s room on one side and the matron’s room on the other side. Behind this block and linked to it by a covered way with open sides, was a small ward block and flanking the administration block to the east and west, two more ward blocks, again linked by covered ways to the central block. Further pavilions were added in 1910 for scarlet fever and diphtheria by E. Simpson of Stirling. In 1912 a ‘Spieresque’ wood and iron measles pavilion was added and an observation block in 1915 designed by R. H. Motion. Extract from the 2nd edition OS map revised in 1924, reproduced by permission of the National Library of Scotland. NETHERLEA HOSPITAL, 65 WEST ROAD, NEWPORT-ON-TAY Netherlea was built as a domestic villa, for the local shipowner, Andrew Leitch, in about 1893 to designs by the Dundee architect Thomas Martin Cappon. It is a large red sandstone building in simple Tudor style, of two storeys and attics, with stick on half-timbering in gables. Andrew Leitch was a prominent figure in Dundee, and was particularly associated with the development of the harbour. Born in Fife, he started out as a colliery clerk, later moving to Dundee as the agent for Halbeath Colliery. From there he progressed to being a coal merchant, then exporter, establishing the Dundee Loch Line Steam Shipping Company. He married in 1859 Isabella Thomson, with whom he had eleven children. She died, at Struan Inn, Banks of Garry, following a carriage accident in July 1897. Andrew Leitch remarried when he was sixty years old in 1902. His second wife, Janet Elizabeth née Smith, became a notable local figure, a supporter of women’s rights, the National Union of Women Workers and many philanthropic causes. She was also the first woman to be elected to the local School Board in Newport. She died in 1913, and her husband outlived her by just three years. In 1917 the contents of the house were auctioned, at that time the house comprised: drawing-room, parlour, dining room, billiard room and hall, 10 bed and dressing-rooms, as well as laundry and kitchen apartments. By 1931, Netherlea was the home of Mr G. L. Wilson, a member of the Cupar Liberal Club, but by 1936 was the home of David Hamilton Brackenridge, who, like Leitch, was a member of the Dundee Harbour Trust. Brackenridge was born in Cupar in 1871, and was educated at Madras College, St Andrews and Dundee High School. He spent 21 years in Calcutta as representative of the Dundee jute merchants, J. C. Duffus & Company. On his return from India he became the local agent for Duffus. He died at the house in January 1939 and a month later his widow had put Netherlea up for sale. The accommodation was listed as comprising: on the ground floor, four public rooms, billiard room, cloakroom and lavatory, kitchen and usual offices; on the first floor, five bedrooms, two bathrooms and maids’ sitting-room and bathroom; on the second floor, three maids’ bedrooms and box room. It also had a modern garage, greenhouse and outhouses, was in excellent condition, electrically fitted throughout, and the grounds tastefully laid out. Presumably the house failed to find a buyer, the contents were sold about a year later, but in 1945 Netherlea was offered to Fife County Council, and its future as a hospital discussed by the Public Health Committee. Before then, during the Second World War, it had been occupied by officers of the Norwegian Air Force. It became a maternity hospital under the NHS with 17 beds, an isolation room and nursery, plus 13 staff bedrooms, the conversion to a hospital was carried out by the architect Frank Pride, of Walker and Pride to plans drawn up in 1946. Although officially opened on 21 July 1948, by the end of September it still hadn’t admitted any expectant mothers. Lieutenant Colonel Noel Baxter of New Gilston, the county convenor for the East Fife Hospital Group Board of Management, visited the hospital expecting it to be up and running and was shocked to find this was not the case. Although Netherlea had a doctor, matron and nursing staff, it couldn’t open to patients because there was no cook. Until one could be appointed, patients were being sent to Dundee, Perthshire or even Edinburgh – ‘all over the shop’ according to the County Medical Officer of Health. OVENSTONE HOSPITAL, PITTENWEEM Bad drainage caused problems at the hospital in the early years of the twentieth century which proved costly to put right and a bone of contention in the local press. It was built as a local authority infectious diseases hospital to designs by David Henry, of St Andrews, and opened in 1896. It later became a convalescent home. Presently the buildings house the Cobalt Contemporary Artists gallery (it is sometimes said to have been an old schoolhouse, but was certainly built as a hospital originally). QUEEN MARGARET HOSPITAL, WHITEFIELD ROAD, DUNFERMLINE One of the main hospitals in Fife. The first phase of the hospital was completed in 1985, the second in 1993. It has a cheerful leggo-like cladding in pink and white stripes. RANDOLPH WEMYSS MEMORIAL HOSPITAL, BUCKHAVEN The white harled cottage hospital at Buckhaven opened on 28 August 1909. It was designed by Alexander Tod of Kirkcaldy for Lady Eva Wemyss. The Wellesley coal pit in Buckhaven was opposite the hospital when it was built and the two were linked by a tunnel. A portion of the hospital’s revenue was created by fines imposed on the miners for breaches of discipline. Randolph Wemyss owned the Wemyss coalfields and after his death in July 1908 his widow, Lady Eva Wemyss, funded the project for a memorial hospital. The plan is of the standard central administration block flanked by two ward blocks favoured at the time but it is dressed up with baronial details. There are circular stair turrets and corbelled bartizans at the angles of the wards. The somewhat eccentric entrance has a Doric portico fronting a circular tower, topped with a conical roof sporting four gableted clock faces. A large extension was built to the south, designed by John Holt of the South East Regional Hospitals Board, or one of his team, linked to the main hospital by a glass walled corridor. ST ANDREWS COMMUNITY HOSPITAL, Largo Road This 40-bed hospital opened in 2009 on the outskirts of the town, replacing the memorial hospital (see below). The building complex also includes a large g.p. clinic – in the splayed pavilion section, an outpatient clinic, pharmacy and palliative care unit. The hospital section is in the butterfly-plan wing at the rear of the site. photograph © C. Blakeman, taken August 2015, from Morrison’s car park. 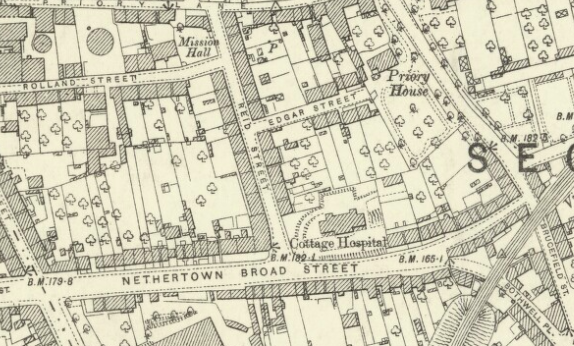 ST ANDREWS FEVER HOSPITAL, St Mary’s Street Initial plans to erect a temporary fever hospital in St Andrews around 1882 were changed to build a permanent hospital on a site in St Mary Street, then on the very edge of St Andrews. It was completed early in 1886. Small and plain, the hospital had two, two-bed wards in each of the wings linked to the central admin block by covered ways. The architect was Mr Henry (probably David Henry) and the contractors were William Ness, Thomas Harris, James Farquharson, William Paterson, Andrew Scott and David Todd. John Wilson supplied grates, James Wilson laid out the grounds, and Buchan exhaust ventilators were installed in the wards. ST ANDREWS MEMORIAL HOSPITAL (demolished) The oldest part of the hospital was opened in 1902 as a new purpose‑built building for the hospital which was founded in 1865. 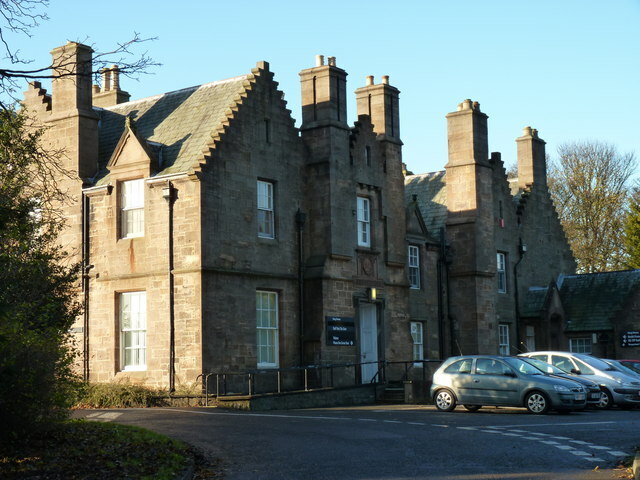 It has long been claimed to have been the first cottage hospital in Scotland, however, research by the Grampian Health Board Archivist, Fiona Watson, has established the prior claim of the Crimond Cottage hospital which also opened in 1865, just prior to the St Andrews hospital. St Andrews Cottage hospital was founded as a memorial to Lady William Douglas of Grangemuir, who died in April 1864. It opened in rented premises at No.33, Abbey Street, one of a row of buildings demolished in about the 1960s. The hospital was intended for the benefit of persons in St Andrews and the surrounding district who were suffering from diseases or accident but not for infectious diseases. There was accommodation for six patients. Extract from the 2nd edition OS map revised in 1893, reproduced by permission of the National Library of Scotland. In 1875 Dr John Moir and his brother Dr Robert Moir called for the establishment of a memorial to Dr John Adamson and Dr Oswald Home Bell and for setting the cottage hospital on a more permanent footing. Through their efforts Greenhill Villa in Abbotsford Place was purchased in 1880 as new premises for the hospital and contained wards named after Adamson and Bell. The accommodation was still rather limited and steps were taken to have a new purpose‑built cottage hospital. According to the Fife News Almanac the plans for the hospital, drawn up by a local architect, Charles F. Anderson, met with the approval of Sir Henry Burdett, editor of The Hospital and ‘one of the best authorities on cottage hospital management’. Extract from the 2nd edition OS map revised in 1912, reproduced by permission of the National Library of Scotland. ST MICHAEL’S WOOD INFECTIOUS DISEASES HOSPITAL, LEUCHARS This small hospital was built by the local authority and opened by Sir Ralph Anstruther in August 1909. It was first proposed to build the hospital in 1896. A competition was held for plans, 21 designs were submitted, including one with circular wards. The winner was William Carruthers Laidlaw, of Edinburgh. Comprising four blocks, three of which survive, the hospital had two ward blocks and a laundry building, each single-storeyed, and a particularly fine staff residence or doctor’s house which survives in good condition with many original features. SOUTHFIELD HOUSE, AUCHTERMUCHTY Southfield House was used as the local authority infectious diseases hospital opening as such in about 1895. After the extension of Cameron Hospital it was used for in‑patient care of children with skin diseases. STRATHEDEN HOSPITAL, SPRINGFIELD Stratheden Hospital was opened as Fife & Kinross District Asylum without ceremony on 4 July 1866 for 200 hundred pauper lunatics, the Fife Herald noted that the first patient to be admitted was a woman ‘who stared considerably at the sight of the palatial display and who had ultimately to be forcibly introduced to a home in everything but name’. Peddie and Kinnear, the Edinburgh architects, were appointed to design the new asylum in 1861 but progress was delayed by the interference of Lord Kinnoul whose amendment to the Lunacy (Scotland) Act allowed pauper lunatics to be accommodated in poorhouses. He was energetic in lobbying the Lunacy Board in an attempt to dissuade them from proceeding until the amendment act was passed in 1863. However, the accommodation for lunatics generally provided in poorhouses was unsuitable and insufficient. As soon as Stratheden was completed the commissioners in Lunacy withdrew the licence to keep lunatics in Dunfermline Poorhouse. Extract from the 2nd edition OS map, surveyed in 1893, reproduced by permission of the National Library of Scotland. the whole of the main building is roofed in excepting the centre block, containing the dining‑hall, amusement room, etc, the roof of which has been delayed in consequence of the iron beams required for its support having been lost at sea. Extract from the 6-inch OS map, revised in 1938, reproduced by permission of the National Library of Scotland. VICTORIA HOSPITAL, DUNNIKIER ROAD, KIRKCALDY Built on the site of the infectious diseases hospital (below) and retaining most of the old brick buildings, the new general hospital was designed by John Holt for the South East Regional Hospitals Board from 1955‑67. The buildings are dominated by the fourteen‑storey ward tower. When work was under way in 1959 on the first phase, providing 123 beds, it was discovered that the ward doorways were too narrow to allow beds to be wheeled through easily. The standard hospital bed, without mattress, sheets and blankets, was 36 inches wide, and the new ward doorways were fractionally under 40 inches wide. 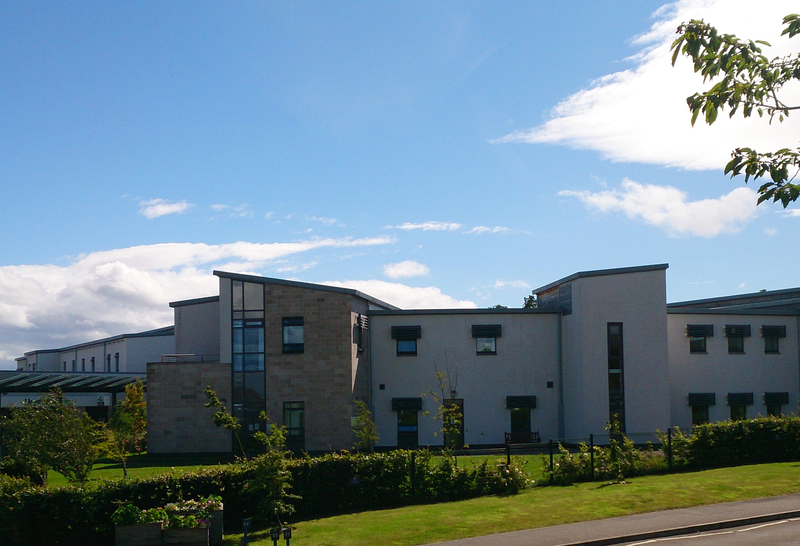 The East Fife Hospitals Board of Management brought the matter up with the Regional Hospitals Board and various suggestions made for easing the beds through the doorways, but widening them was dismissed as too costly. Metal strips were proposed to be added to the door frames to protect the woodwork, narrower beds were rejected, but narrower mattresses would be used. The matter was also to be ‘kept in mind’ when plans were drawn up for the second extension, a 220-bed building. Further extensions were built to the north by the architects Basil Spence, Glover and Ferguson in 1980‑83, and a large new wing built in 2009-12 providing 500 beds, 11 operating theatre suites and an A&E department. This was carried out on a PFI contract by Balfour Beatty, with the architects the Building Design Partnership. VICTORIA INFECTIOUS DISEASES HOSPITAL, KIRKCALDY Plans were adopted by the Glasgow architects, Campbell Douglas & Morrison in 1897 and approved by the Local Government Board with minor alterations for the Kirkcaldy Burgh Infectious Diseases Hospital. It provided accommodation for 33 patients and in 1908 a sanatorium was added. Extract from the 2nd edition OS map, revised in 1913, reproduced by permission of the National Library of Scotland. The hospital has now been absorbed into the Victoria Hospital. The former administration building, a plain brick building of two storeys and attic, and ward blocks remain at the foot of the present site. The Sanatorium block with spreading eaves has semi‑octagonal outer bays linked by a verandah. 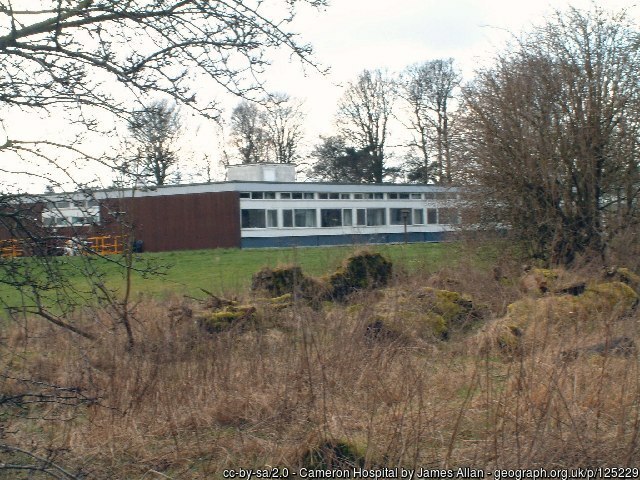 WHYTEMAN’S BRAE HOSPITAL, KIRKCALDY Plans were approved in November 1973 for a hospital of 180 beds and 80 day places. The building opened in 1983. Today it cares for psychiatric and elderly patients. WILLIAMSTEAD ISOLATION HOSPITAL, GUARDBRIDGE Otherwise Williamstead Smallpox Hospital, was set up by St Andrews Town Council. It opened c.1902, but was seldom used. The last patient was admitted in 1912, and by the late 1920s its closure was under discussion. OS 25-inch map, surveyed in 1912, reproduced by permission of the National Library of Scotland. The building survived into the 1960s, (just south of Seggiehill Crossing, but has since been demolished. WOOD’S HOSPITAL, UPPER LARGO Founded by John Wood in the 1660s, the original almshouse was built in 1665 by John Milne. Extract from the 2nd edition OS map, revised in 1893, reproduced by permission of the National Library of Scotland. Not really a hospital, this is an almshouse and was rebuilt in 1830 by James Leslie, engineer. It was converted into cottage housing in the 1960s.